A visit to this historical Andalucían town is a journey almost 5,000 years back in time, beginning with the Bronze Age and the native Iberians. The timeline is there to be followed in this fascinating city's profusion of burial mounds, dolmens, Roman baths, a Moorish Castle, Gothic churches, Renaissance fountains and baroque bell towers. The first sighting of Antequera in the distance is that of a typical medieval town, with the spires of her many churches and the walls and towers of the great Moorish fortress silhouetted against the sky. Spread out in the valley below lie rich farmlands irrigated by the Guadalhorce River. For centuries this has been one of Andalucía's most fertile areas, and is currently a leading producer of asparagus, cereals and olives. In summer, its fields turn brilliant yellow with sunflowers. The town and valley are overlooked by an enormous crag of limestone, 880 metres high, called La Peña de los Enamorados, or "The Lovers' Leap". The name comes from a local legend about an impossible love affair between a young Christian man from Antequera and a beautiful Moorish girl from nearby Archidona, who were driven to the top of the cliff by the Moorish soldiers, where, rather than renounce their love, they chose to hurl themselves into the abyss. One of Antequera's most impressive sights is its dolmens, located in a park to the west of the town, the most spectacular of which is the Cueva de la Menga. These megalithic mass tombs, made of huge slabs of rock, were created by the original Iberian people and date back 5,000 years. There are many such dolmens in Andalucía, but none as large as the Cueva de la Menga. When it was excavated in the nineteenth century, many hundreds of skeletons were found in its inner chamber. 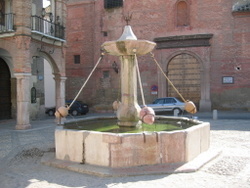 Other fascinating monuments to be seen in the town are the recently excavated Roman baths, the magnificent Renaissance church of Santa María, la Mayor Church, the Church of Nuestra Señora del Carmen, the 19th century bullring, and the Arch of the Giants, built in 1585, which leads up to the 13th century Moorish castle. 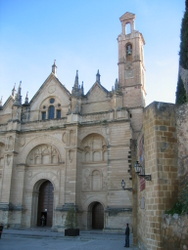 We recommend the Convento de las Descalzas, the Barefoot Carmelitas, on the square of the same name. Inside the heavy wooden entrance, there is a small counter with a display of bakery products and prices, next to a revolving wooden door. You pull a rope which rings a bell, and then hear a woman's voice say "Sí", after which you give your order and place your money on the tray. The hidden nun then spins the tray around, with the pastries emerging from the door.